Former Bruin Tyler Lamb finished with 20 points, four rebounds, two assists and three steals in his 49er debut on Thursday. The last time Tyler Lamb faced USC, he was wearing Bruin blue. On Thursday night he made his debut in black and gold as his 49ers faced the Trojans at the Walter Pyramid in Long Beach. But the feeling was still the same. "I’ve been through a lot with USC," Lamb said. "I’ve only lost to them once since I’ve been in college and I want to keep it that way." His 20 points aided significantly in keeping it that way in a 72-71 victory. The former UCLA guard suited up for his first college basketball game since Nov. 9 of last year. After injuring his left knee in the Bruins’ 2012-13 home opener, he underwent surgery and asked for his release from UCLA. Due to transfer rules, he sat out the fall semester and watched as his team lost nine straight. But Thursday night he put in big performance off the bench, scoring 18 points in the first half alone. Lamb’s presence effectively took some of the pressure off of leading scorers Mike Caffey and Dan Jennings and gave point guard Caffey a versatile scoring threat to pass off to. "Not only was he a scorer but he was more of a leader," Caffey said. "He helped out a big part on scoring, he helped out a lot defensive-wise and he was just a big impact on the game." Lamb slowed significantly in the second half but managed to finish with 20 points, four rebounds, two assists and three steals in his 49er debut. His first three-pointer, a high-arching shot that swished perfectly through the net, reminded him of how good it felt to be on the court again. "It helped me a lot, it just boosted my confidence even more," Lamb said. "I knew as soon as A.J. (Spencer) got the ball he had seen me. He hit me and I was wide open. "As soon as I shot it felt good and I knew it was going in." The pressure has been all on Caffey and forward Dan Jennings as the leaders and two of few veteran presences on the team, but a brutal non-conference schedule had the team searching over the past few weeks. But Lamb, who has been able to practice with the team for the last year as he rehabbed his knee, was an instant sparkplug and the chemistry between him and Caffey was obvious from the start. "The whole process of building a team is all about confidence and it starts with your point guard," said head coach Dan Monson. "It gives him not just confidence but it gives him another guy…There’s no question this team was a little bit short of scoring and that gives us another guy you have to guard. It makes it harder to key on Mike." For his first outing in over a year, both Lamb and the 49ers were more than satisfied. 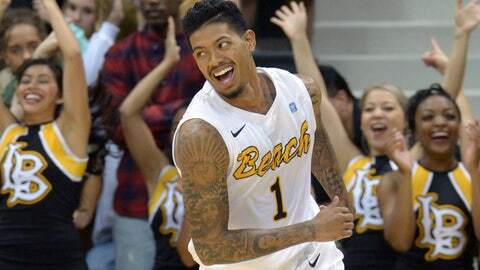 But a continuing effort by Lamb is now needed as Long Beach heads into Big West play. No longer the favorites in the conference, Lamb could change that. "We needed this win to kind of lift us up, that’s what we’ve been working on in practice," Lamb said. "My guys went out there and executed and it was great."